Home >Debates >The Hobbit: What if Smaug was a Snake? The Hobbit: What if Smaug was a Snake? Alot of people are scared of snakes, no one is scared of dragons as they are fully makebelieve. Often times the most effective villains are villains were the audience can relate with i.e. if someone is scared of snakes they will understand Bilbo's fear/caution and the viewer will be more engrossed. I am not talking about a snake like the Basilisk from Harry Potter etc... Just picture Smaug but change him to a snake (http://goo.gl...) The snake would still be able to breath fire, but it would also have Venomous teeth, the ability to crush it's victims and snakes are often seen as the greedy, cruel, evil and mean animals that is usually in films. Oh and Smaug would still speak (love Smaug's voice) Snakes also look meaner and more intimidating, especially the Many Horned Adder in the URL. I understand I am kinda messing with the source material, just imagine you have never heard of Smaug and have no idea he is a dragon and picture him as a snake. Does anyone agree with me? or understand were I am coming from? Please reply and be nice. I imagine everyone will disagree but o'well. Saying that no one is afraid of anything make believe is ridiculous. Kids are afraid of monsters under there bed. Are you literally disregarding every horror movie that had a fictional character? People still screamed at some Vampire movies... Not the twinkle at the daytime type. But many horror movies are successful with fake characters. And who says giant snakes aren't made up? Furthermore, who makes this movie's goal to scare the audience? Really! Also remember that the cave is in the top of a ginormous mountain. How's the snake going to get their? They can't fly. If they could, it'd make them a dragon. We also have the problem of the movie being made for a dragon, not a snake. You can't have the Black Arrows, you can't have him fly to lake town, etc... It would be re writing the book. First off, no were did I say that all make believe characters are not scary? I said 'no one is scared of dragons' and I have good reason to say so, I have not met/talked with one person who thinks that dragons are scary. Heck, I haven't talked to many people who even think dragons make that gouda villain. They have been pussified in the modern day, just like Vampires. This is why a dragon today is frowned upon by some people to have as a villain in a story. Second, were did I say the giant snakes aren't made up? I implied that a snake would be more effective as a villain than a dragon for the following reason ' Often times the most effective villains are villains were the audience can relate with' We have seen this with characters like The Joker, Hannibal etc... These are villains that the viewer can relate with and thus creates a good conflict. Five, were did I imply that they should've changed it to a snake? I said it would've been interesting to see what it would have been like if it was a snake, sorry if I portrayed this idea poorly. And finally, you could still have the black arrows. You would just have to find an alternative method to have it pierce his skin and kill him, and while he may not be able to fly to lake town he could still swim and if he was big enough could rise in the strike position (http://www0.artflakes.com...) and attack the city, if done right you could even have the Black Arrow hit Smaug from the guard tower (again only if Smaug is big enough to dwarf the city). And it wouldn't be rewriting the book, just altering the book for a different purpose/re-imagining. Kinda like what happens with Spiderman, Batman and Superman comics. There are always re-imaginings and alternate paths. Thank you for taking the time to debate this with me. "First off, no were did I say that all make believe characters are not scary?" Round One: "no one is scared of dragons as they are fully make believe"
"I said 'no one is scared of dragons' and I have good reason to say so, I have not met/talked with one person who thinks that dragons are scary. Heck, I haven't talked to many people who even think dragons make that gouda villain. They have been pussified in the modern day, just like Vampires. This is why a dragon today is frowned upon by some people to have as a villain in a story"
My opponent now claims that in his experiences, he has not talked to many people (No surprise there) who think dragons are scary. This is the anecdotal fallacy. Instead of presenting a sound argument on how people don't find dragons scary, or evidence of his claims, he gives a personal experience. "Second, were did I say the giant snakes aren't made up?" No where. But because they are made up they aren't scary, just like drags right? "I implied that a snake would be more effective as a villain than a dragon for the following reason ' Often times the most effective villains are villains were the audience can relate with' We have seen this with characters like The Joker, Hannibal etc... These are villains that the viewer can relate with and thus creates a good conflict"
Giant fire breathing snakes aren't real... Hate to break it to you. The only real difference is the wings and limbs. "Four, the entrance to Erebor is not on-top of any mountain, it is at the base of a mountain (the lonely mountain) (http://www.flicksandbits.com......) Have you even seen the film? or read the book? I think not! (sarcasm) 'How's the snake going to get their' The entrance is on the ground, the snake would simply slither in (best way to describe it) but even if it was on-top of the mountain the snake could still get there, you forget that snakes are excellent climbers and can climb vertical objects like trees etc..."
They had to go up a narrow path on a giant dwarf statue in the movie. Wouldn't the path be to narrow for a ginormous snake? Smaug (The Dragon) is able to simply fly up there, providing a reasonable explanation for his presence. I would however like to focus on your last part of the debate. 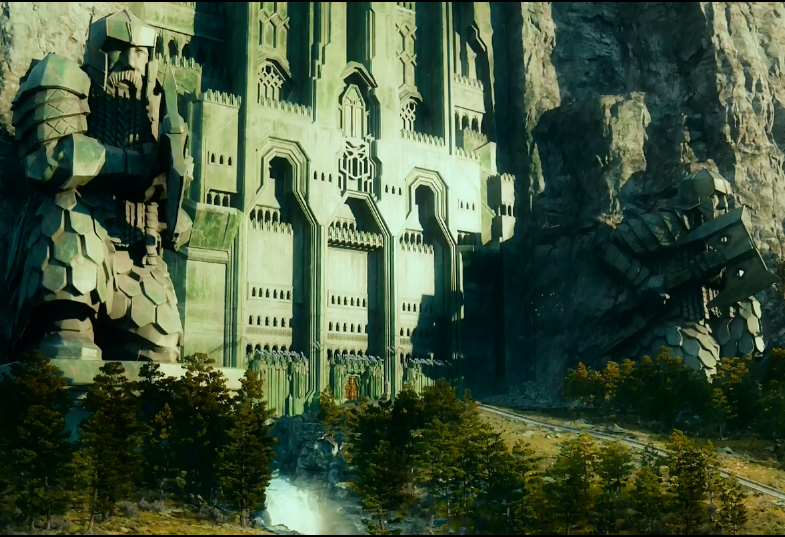 'They had to go up a narrow path on a giant dwarf statue in the movie. Wouldn't the path be to narrow for a generous snake? Smaug (The Dragon) is able to simply fly up there, providing a reasonable explanation for his presence.' Okay, the narrow path they went up on the dwarf statue is one of the many secret doors into Erebor (not the main door) This is the main door into Erebor (http://static3.wikia.nocookie.net...) You are talking about the secret passage that unlocks on Durins Day. Smaug never entered threw the secret door, he smashed his way through the main door in 'An Unexpected Journey'. A snake could do the exact same thing, break down the door with fire and enter Erebor. (I actually doubt you have seen the film or read the book, this is basic stuff. Everyone who has seen the film or read the book knows Smaug entered through the main door, not the secret passage on-top of the Statue) You either haven't read the book/seen the film or pay poor attention to detail. Yet again, my opponent has not provided a single source to prove his claims. Thus it can be dismissed. "That's which can be proven without evidence can be dismissed witouth evidence as well"- Hitchens. It's another logical fallacy to say that you read a poll somewhere, without giving any actual evidence. I read a poll that penguins are terrifying. My argument is just as strong as his now, and Smaug should be a penguine. A giant one who can breath fire. There are actually Komodo dragons on which Dragons could build upon. The inky difference is the size, wings, and fire. Dragons are 78% real now! making my opponents point invalid. 3. My opponent therefore has no proof. 4. Therefore, the BoP has not been satisfied then. And by the way, having a "base" doesn't mean anything. Take the penguins for example mate. Also if I say: "No one loves you, but thanks"
Well that was sarcasm. I through it in there for fun and games, just like you through in an insult then put (Sarcasm) next to it. I thought you would get that... But it would actually support my argument if you could not catch on to a simplistic thing such as sarcasm. "I can't think of one time I attacked you"
You could also reference the people who commented on the debate, who both declare that you at some point used ad hominem. Let me explain why I always thank the person at the end of a debate/argument. I firmly believe that you should never end on bad terms, I also don't take debating that seriously. In a debate it may turn ugly but at the end of the day debating is just a pass time. I also don't get why you basically try to commit ad hominem the entire time instead of arguments, then after wards say Thank You. Lol, it takes away the whole point of the Thank You when you basically told them to go shoot themselves. When I said room I was referring to the character count. As in the room to type within the allotted characters. You did in fact use ad hominem first, if you count me pointing out your tons of logical fallacies as insults. Yet again, I like to debate in the debate rounds. If you want to start another debate, then challenge me. There's a reason this is titled "Comments" and the rounds where you debate is literally titled "Debate Round"
I also wrote my post late at night, and payed little attention to it as your debate was hardly worth any attention and it was Christmas! You never said anything about the character count, all you said was 'you didn't have any room? Lol you created the debate...' nowhere in this sentence is there anything containing the word 'Characters'. I also never thought I would need to go above 4000 characters, I figured that the person who would debate me would have seen 'The Hobbit DOS' or read the book (which I gather you haven't with your poor understanding of the story) and that he/she would be able to understand basic concepts and actually be able to produce a decent argument which doesn't use ad hominem attacks. You are very childish. I went into this debate expecting to loose, I expected my opponent (who was unfortunately you) to give evidence as to why Smaug should only be a dragon and that he would be crap as a snake. You tell me to give evidence, I have. You are the one who needs to give evidence. But instead you went off rambling about other pointless stuff. I know about the character count mate... I said that you should have thought of that ahead of time then. Or just typed less words! @DudeStop Ever heard of character count? I left it at 4000 characters. With the extra evidence I provided it would've been over 4000 and you cannot change it after the debate has been started. Uh, no. I actually like to debate in the debate round areas, you may want to refrain from doing that, some people may count it as conduct.